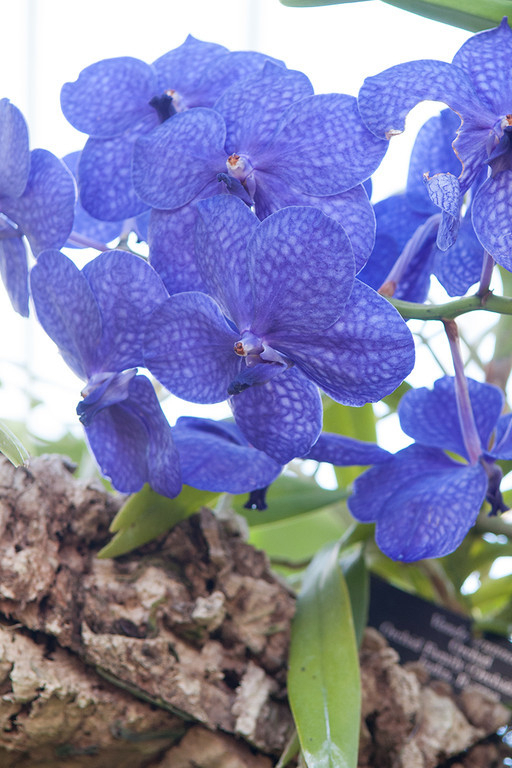 The Chicago Botanic Garden is offering a great winter escape sans the air fare at their second annual Orchid Show, Saturday, February 14 through Sunday, March 15. 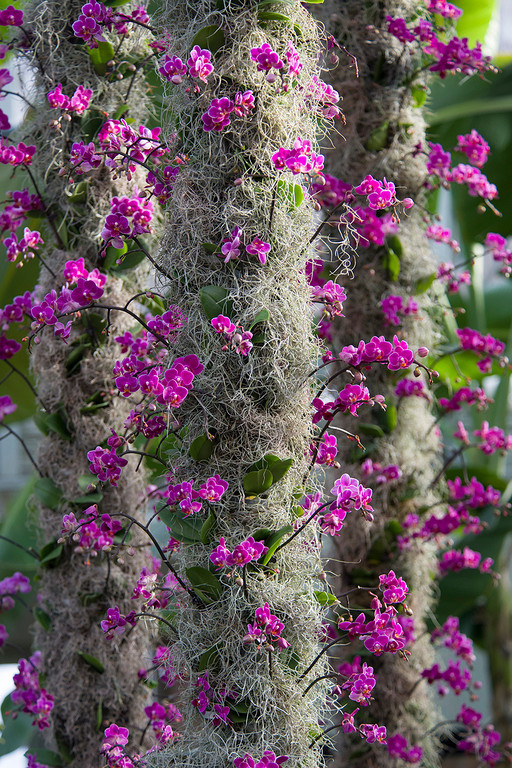 The 10,000 exotic, fragrant and vibrant blooming orchids of yellow, orange, red, pink, purple and blue offer a balmy oasis to greet visitors at the Garden’s Regenstein Center as they come in from the cold. At a preview of the show on Tuesday, there were orchids, orchids everywhere. As we entered Krehbiel Gallery we were greeted by clusters of orchids suspended over a long reflecting pool. The walls of the gallery were awash with amazing larger than life photographs by photographer Anne Belmont from the 2014 Orchid Show—available for viewing and purchase. 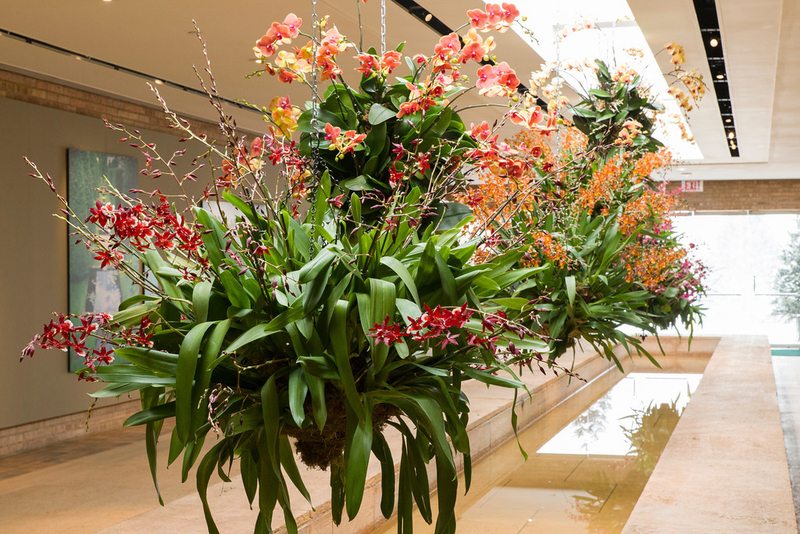 Next we walked through the adjoining Nichols Hall that features an allée of palms supporting bursts of yellow Oncidium and bright purple-and-pink Phalaenopsis orchids. The displays in both Krehbiel Gallery and Nicholas Hall are non-ticketed displays. To continue through the rest of the show, visitors must purchase a ticket (information at bottom of post). The Bridge Gallery, lined with bamboo poles and orchids, and edged with reed orchids and grassy foliage, is stop one on the ticketed tour. Next, we entered the Joutras Gallery, which features a reflecting pool lined with ferns, vines, mosses and lady slipper orchids. Stands of bamboo poles in each corner support a canopy of yellow and pinkish-yellow Phalaenopsis orchids. 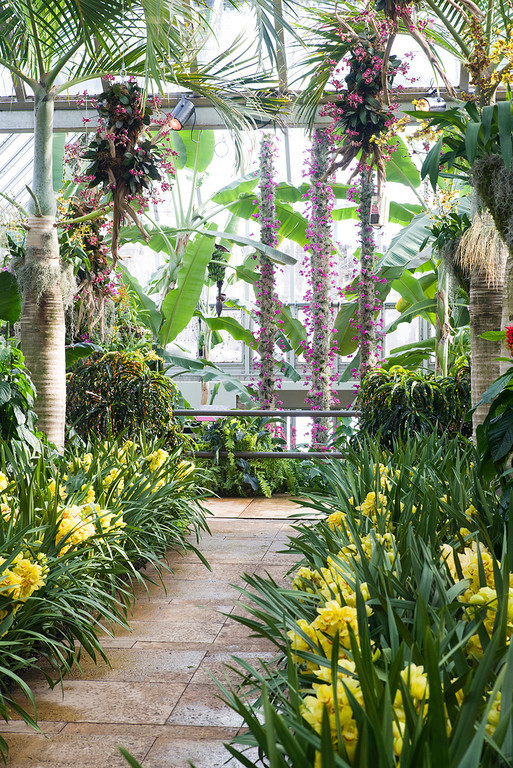 The Gallery gives way to the Greenhouses, filled floor to ceiling with orchids growing in the ground and staged on trees and hanging structures reminiscent of lanterns--a true tropical paradise. A series of complimentary morning concerts held from 10 to 11 a.m. on February 17, 19, 24 and 26, and March 3, 5, 10 and 12. A weekend orchid marketplace featuring orchid-related merchandise, orchids, information and a repotting station, from 10 a.m. to 4 p.m. every Saturday and Sunday from February 14 through March 15. 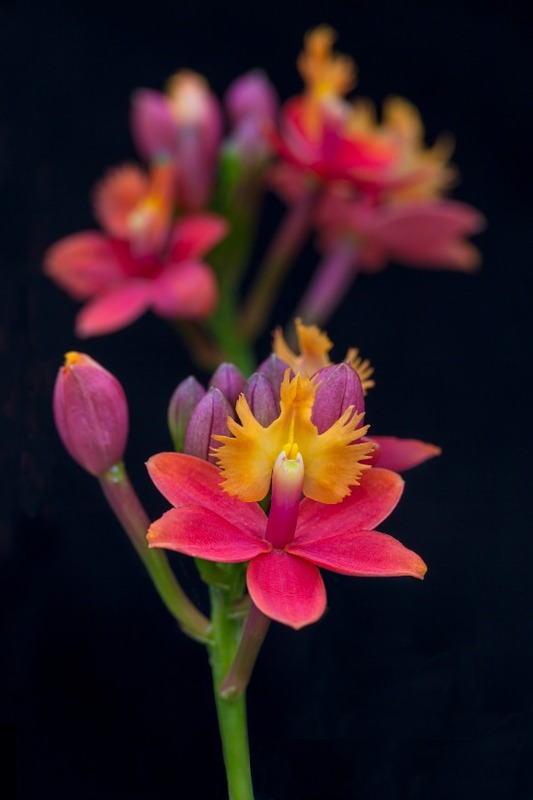 The Illinois Orchid Society Show & Sale from 10 a.m. to 4 p.m. on Saturday and Sunday, March 14 and 15. A rare book exhibition, Orchidelirium: Illustrated Orchidaceae, featuring volumes of orchid illustrations, will be on display at the Lenhardt Library from February 14 through April 19. A free library talk on the exhibition at 2 p.m. on Tuesday, February 24, and Sunday, March 1. An opening night cocktail party, from 5 to 7:30 p.m. on Friday, February 13. Tickets are $125 and include cocktails, hors d’oeuvres and admission to the exhibition. Members’ Night, from 5 to 7:30 p.m. on Wednesday, February 25, provides special hours, entertainment and refreshments for members only. Regular ticket fees apply. Evening with Orchids cocktail tasting is from 6 to 8 p.m. on Thursday, March 12. Advance tickets are $25; day-of tickets are $28. Members receive $5 off each ticket. 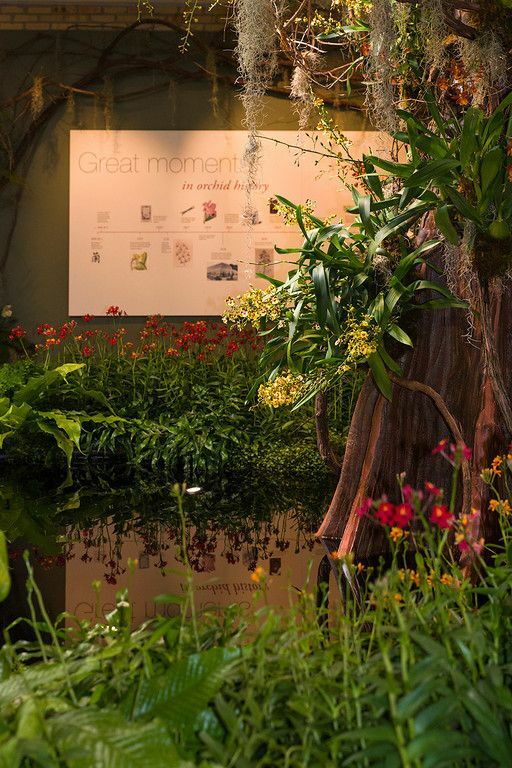 Orchid-themed classes will be offered for families and adults in conjunction with the show. A post-show Orchid sale in Nichols Hall. Members only can shop from 10 a.m. to 2 p.m. on Thursday, March 19. The sale will open to the general public, as long as supplies last, from 10 a.m. to 2 p.m. on Friday, March 20, and Saturday, March 21. Admission is $10 for adults; and $8 for seniors ages 62 and older and children ages 3 to 12. Children 2 and younger are free. Members receive $2 off each ticket. Both Krehbiel Gallery and Nichols Hall are free admission. Show hours are 10 a.m. to 4 p.m. daily from February 14 through March 15, 2015. The Chicago Botanic Garden is located at 1000 Lake Cook Road in Glencoe. Entrance to the garden is free. Parking is $25 for non-members and free for members. All photos in post are from the 2014 Orchid Show.